Wake up in time to save Gotham with the LEGO Batman Mini-Figure Alarm Clock! 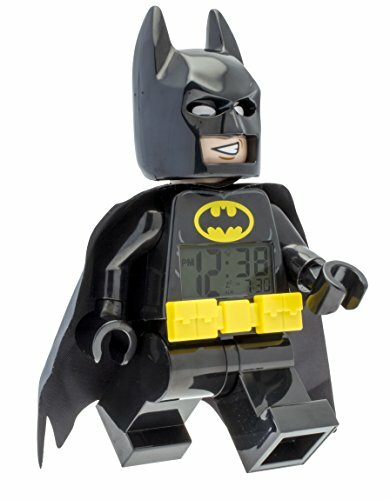 Standing just over 9.5 , make your LEGO d cor collection fun and functional with a jumbo-sized Batman minifigure featuring an easy-to-read digital LCD display, poseable arms, wrists and legs, plus snooze and backlight functions, activated simply by pressing down on Batman's head. Help save Gotham City with this all new LEGO Batman Movie Batman clock! The perfect addition to every LEGO DC Universe Super Heroes collection, features a digital, lighted display and alarm clock. The snooze and backlight functions are activated by pushing down on the minifigure's head. A great addition to the LEGO Super Heroes collection. Snooze and alarm functions. Light glows yellow. 2x AAA batteries included. For children 6+. BUILT IN AMAZON ALEXA AND SPEAKER For children, it can be a good storyteller, teacher, musician; for parents, it can be used by checking news and weather report, setting alarm and timer, controlling smart home devices and more. The built-in 5W speaker provides rich sound and music from Amazon Music with no need for extra devices. REMOTE CONTROL BY VOBOT APPControl Vobot Bunny remotely from your smartphone via Wi-Fi. Therefore you can manage the sleep trainer schedule or change the setting anywhere on the planet as long as your device is online. And the parent control and kids lock function can disable Alexa and buttons on Vobot Bunny according to your needs. EASY SLEEP TRAINER MODEVobot Bunny has two pre-set scenario and of course you can create your own scenario. In OK to Wake, the red light and birds call means your little one can play around in bed; the yellow light and dawn sound mean your little one can play in he/her room; the green light means it's ok to leave the room. In Good Night, the blue light means your little one should be in bed and it's story time; the yellow light means it's time to sleep. 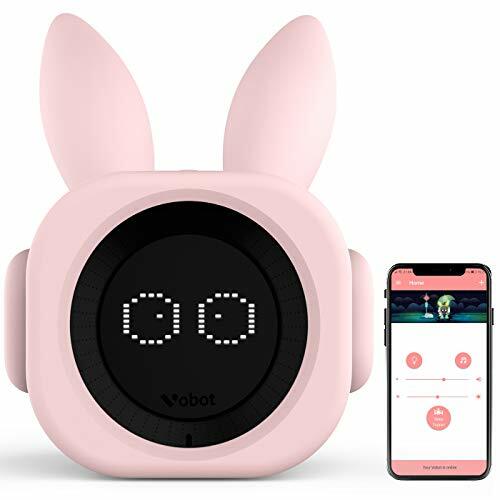 GROW WITH KIDS Vobot Bunny with RGB soft night lights and suitable ambiance sounds, kids can choose the color they like and you can also upload music which your kids like. Integrated Alexa Skills capable of telling stories, playing songs, answer questions and your kid will never get bored. BUILT IN AMAZON ALEXA AND SPEAKER- For children, it can be a good storyteller, teacher, musician; for parents, it can be used by checking news and weather report, setting alarm and timer, controlling smart home devices and more. The built-in 5W speaker provides rich sound and music from Amazon Music with no need for extra devices. REMOTE CONTROL BY VOBOT APP- Control Vobot Bunny remotely from your smartphone via Wi-Fi. Therefore you can manage the sleep trainer schedule or change the setting anywhere on the planet as long as your device is online. And the parent control and kids lock function can disable Alexa and buttons on Vobot Bunny according to your needs. EASY SLEEP TRAINER MODE- Vobot Bunny has two pre-set scenario and of course you can create your own scenario. In OK to Wake, the red light and birds call means your little one can play around in bed; the yellow light and dawn sound mean your little one can play in he/her room; the green light means it's ok to leave the room. In Good Night, the blue light means your little one should be in bed and it's story time; the yellow light means it's time to sleep. 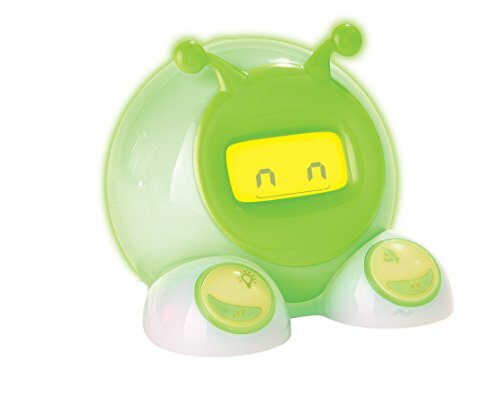 GROW WITH KIDS- Vobot Bunny with RGB soft night lights and suitable ambiance sounds, kids can choose the color they like and you can also upload music which your kids like. Integrated Alexa Skills capable of telling stories, playing songs, answer questions and your kid will never get bored. WHY CHOOSE US- Reasonable price, good quality, superior service, one-year limited warranty and lifetime technical support. If you are not happy, contact our customer support team! (help@getvobot.com) Package: 1 Vobot Bunny,1 micro USB cable,1 power adaptor, and 1 user manual. 1. Press the SET button to set the time and date. 2. Press the UP button and the DOWN button to get the desired value you want. 3. To press the AL button again, you will return to the mode of time display. What s the Function of the TAP Button? Warranty: For any reason, if you aren't 100% satisfied with your purchase, please don't hesitate to contact us to request a refund or replacement. The iBaby Monitor M2S is a fully loaded baby monitoring system in a compact design. With the iBaby Care App, you can play, care, and rock out with your little one from anywhere in the world! FULL COVERAGE WITH 1080P HIGH DEFINITION : 1080p full HD video resolution with zoom, crystal clear night vision,enjoy fluent and the clearest video. TWO WAY AUDIO : Two-way audio, no external speakers necessary,play lullabies and stories, add Mp3 music for baby or record your own voice. TEMPERATURE & HUMIDITY DETECTOR : Less than 60 Seconds Installation, 2.4GHz Wi-Fi Frequency, and more. EARLY CHILDHOOD EDUCATION Play lullabies and stories, add Mp3 music or connect to iTunes or Google library. ALERTS & FULL PRIVACY CONTROL : Get sound and motion alerts with pictures & videos, you can add unlimited users and monitors.Sleep mode, social share and parenting community. 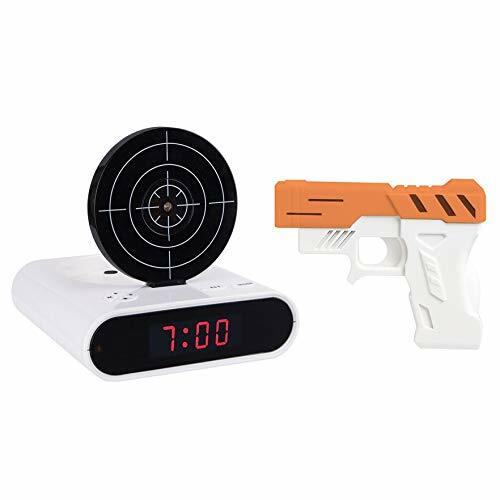 Start every morning off right with the Wembley lazer target alarm clock! Wake up to your own recording for extra personalization! 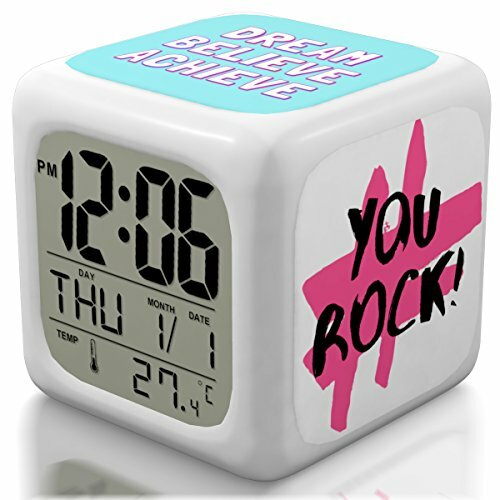 Your search for a unique, cute and cool alarm clock for children, kids, teen, boys or girls is over. Why choose this inspiring portable alarm clock model? This bedside alarm clock features fun animations that give it personality! 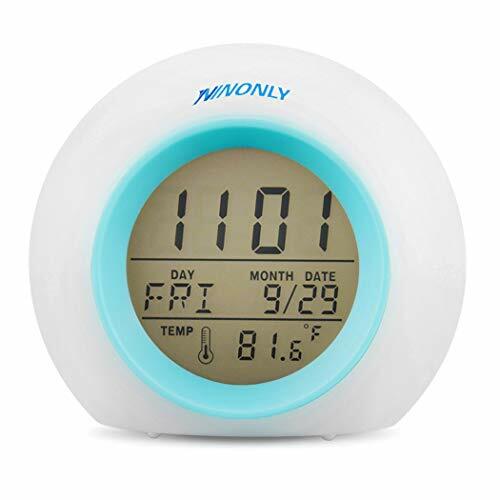 The convenient nap timer and dual night light that glows green to tell children it s OK to get out of bed make this alarm clock a must-have for families with young children! Includes two fun, interchangeable faceplates: pink flower and green bug. USB cord with battery backup (4 AA, not included). Wall adaper not included. Approximately 4.5". Customizable: Parents set the OK to Wake, time and brightness. Ages 3-5 - Teach me when it's OK to Wake!. 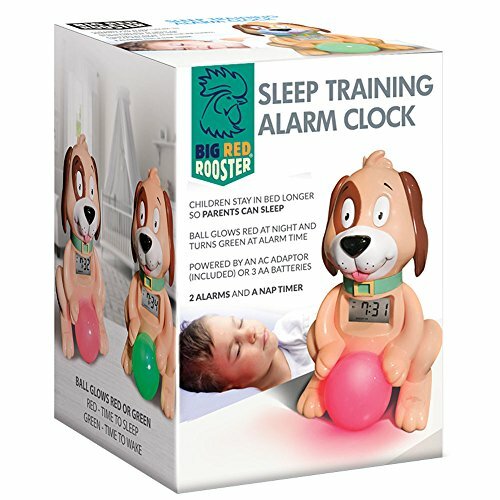 Ages 5+ - Teach me to use an Alarm Clock! PATENTED, BEAUTIFUL DESIGN - A runaway crowdfunding success, MELLA has been featured in publications such as Mashable and Yanko Design for its numerous features and modern design. Who says children's products can't be beautiful too? 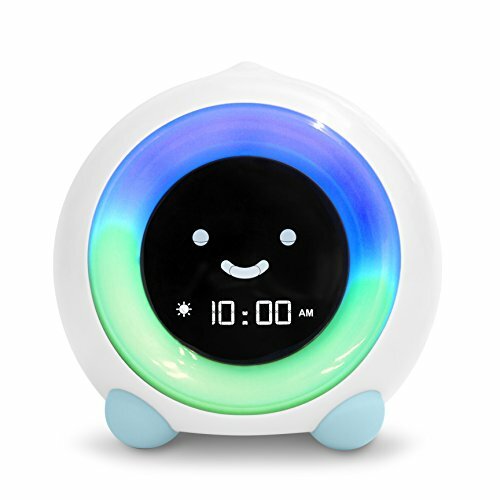 KEEP YOUR KID IN BED LONGER AND GET MORE SLEEP - MELLA uses colors and facial expressions to teach your kids when it's time for bed and time to wake up. Half an hour before it's time to wake up, MELLA will glow yellow, signaling it's almost time to start the day. When MELLA turns green, it's time to wake up! ALL-IN-ONE SLEEP GADGET GROWS WITH YOUR CHILD - MELLA also features three sleep sound options and five night light colors to soothe your child to sleep. 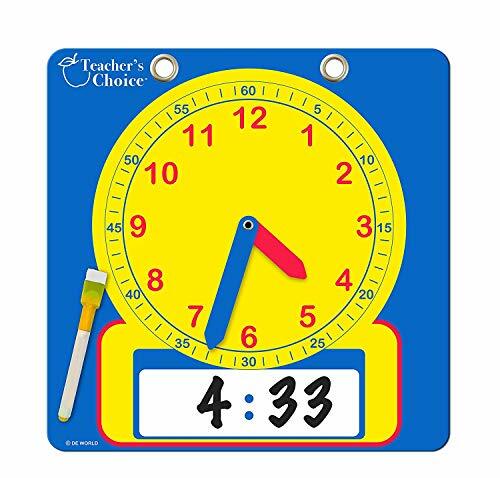 MELLA also features three alarm sounds and both an alarm and silent countdown for timed activities for older children.